As Canadians, we’re bound to welcome sunshine and warmer days with open arms. Yet we need to be careful that we’re not putting ourselves at risk of sunburn or skin cancer when we forget to use sunscreen. 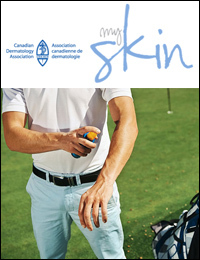 In our impatience to get outside and enjoy our favourite activities, slathering on sunscreen can seem like a chore, so manufacturers try to make life a little easier by increasing the number of spray sunscreens on drugstore shelves. There are two kinds of spray sunscreens: continuous spray aerosol sunscreens and pump-action sunscreens. Continuous spray aerosol sunscreens are packaged in pressurized canisters. They come out as a mist when sprayed and often feel cool on the skin. It’s important to remember that because these sunscreens are pressurized and dispersed using a combustible propellant, they shouldn’t be used around an open flame or heat source. Aerosol sunscreens should always be used in well-ventilated areas. Since aerosol sunscreens are applied as a mist, there’s a misconception that we can simply spray and go. In fact, these sunscreens still need to be rubbed into the skin to ensure an even coverage and that no spots are missed. Spraying sunscreen directly into the face is not a good idea. It’s important not to inhale sunscreen and getting it into the eyes can be extremely painful. Instead, spray the sunscreen into your hands, then rub your hands over your face while carefully avoiding contact with the eyes. Pump-action sunscreens sit between traditional lotions and aerosols on the sunscreen spectrum. They look more like traditional sunscreens because they appear white when initially applied to the skin but have a more milk-like consistency. As with aerosol sunscreens, pump-action sunscreens need to be rubbed into the skin when applied and should not be sprayed directly into the face. Ultimately, what’s most important is that sunscreen – no matter what kind – is part of our regular sun safety routine that includes hats, sunglasses, appropriate clothing to cover the skin, avoiding peak hours and seeking shade. Protecting our skin now will help to keep it healthy and young and save us from extra visits to the dermatologist down the road.